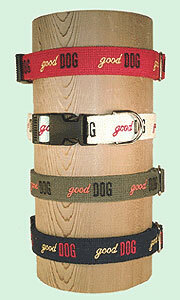 The message repeats around the cotton webbed collar, which snaps closed with a durable plastic fastener. Red, natural, olive, and blue. Companion lead picks up design on the handle.